THE FOLLOWING UP QUESTION SHOULD HAVE BEEN, WAS IT A REVERENT POSITION FOR MONICA LEWINSKY? So dog whistles is the new code for right wing conspiracy … It would appear that the misguided and out of touch Hillary Clinton has decided to chime in on the NFL kneeling for the National Anthem. Hillary Clinton stated while on her book tour over seas that kneeling during the National Anthem is a reverent position. She said, “That was not against our anthem or our flag. Actually, kneeling is a reverent position. It was to demonstrate in a peaceful way against racism and injustice in our criminal system.” REALLY? Was it reverent Hillary when Monica was on her knees with your husband? Hmm? This is why Hillary Clinton was defeated. One is supposed to pick their battles. Clinton went on to say, “I think it would be a grave error for Democrats to recede from those fights, so therefore we have to stand up, fight back, resist.” So the LEFT’s battle is to disrespect America. Compare this to Trump’s “Making America Great Again.” Liberals like Hillary and the rest are going to march the Democrat party right over the cliff. President Donald Trump: Clinton’s defense of kneeling NFL players shows ‘why she didn’t win‘. President Donald Trump is 100% correct. This is one of the reasons why she didn’t win the 2016 presidential election. Hillary Clinton is out of touch with the majority of mainstream America. A majority of Americans believe the player should stand for the national anthem. And on overwhelming majority of NFL fans think the same. But you have a misguided, clueless liberal in Hillary Clinton who just believes in being disrespectful in order to protest is perfectly okay. It is no wonder why she lost. Hillary is a hateful individual who would blame everyone else for her 2016 election loss, except for the fact that she was on the wrong side of every issue of the American people. Monday afternoon, Trump said kneeling during the anthem is the same as sitting, a show of disrespect. He told reporters that “there’s plenty of time to do lots of other things” outside of the anthem, and that the protests had sparked nationwide anger with the NFL, the nation’s most popular sports league. SO DOES DEMOCRAT HOUSE MINORITY LEADER NANCY PELOSI THINK HER FATHER WAS A RACIST? Well how about this bit of irony. House Democrat Minority Leader Nancy Pelosi’s father helped dedicate statues of Confederate generals Robert E. Lee and “Stonewall” Jackson in Baltimore, Maryland in 1948. 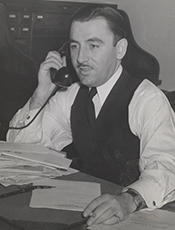 According to reports, Pelosi’s father, the late Thomas D’Alesandro Jr., the then mayor of Baltimore, spoke out on May 2, 1948 in praise and honored Confederate generals Robert E. Lee and Thomas “Stonewall” Jackson. My how the times have changed. So why isn’t Pelosi denouncing her father? The very statues that Pelosi, Democrats and the LEFT look to tear down, are the very one’s her father helped create. Where is her outrage? Talk about the height of hypocrisy. Talk about your inconsistent truths. Pelosi’s father said during the dedication, “Today with our nation beset by subversive groups and propaganda which seeks to destroy our national unity, we can look for inspiration to the lives of Lee and Jackson to remind us to be resolute and determined in preserving our sacred institutions.” Um, what “scared institutions” is he referring to? We are still waiting for Pelosi to condemn and admonish her father. Still waiting. When will Pelosi be resigning from office due to her father’s actions? I mean dedicating statutes to the very slave holders and sons of the Confederacy that the LEFT today has lost their collective minds over. 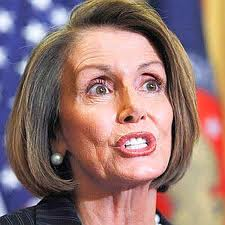 To follow their liberal logic, Pelosi should be resigning from office. BTW Nancy, dad would be so proud of you. House Minority Leader Nancy Pelosi has ramped up calls to remove “reprehensible” Confederate statues from the halls of Congress — but left unsaid in her public denunciations is that her father helped dedicate such a statue decades ago while mayor of Baltimore. The above provides a history lesson to the millennials of today. The Democrat party was the party party of slavery, segregation and Jim Crow. Maybe this is why the LEFT wants to tear down history, so that no one knows what their really history was all about. The Baltimore Sun: Lee-Jackson monument was welcomed in Baltimore. I think it is important for The Baltimore Sun to remind its readers on how it reported the official dedication of the Lee/Jackson Monument on May 2, 1948. A crowd of 3,000 came to the Wyman Park dedication to lots of pomp and fanfare. I believe what was said then must be taken into historical context. The dedication words were spoken from the heart by two of Maryland’s most revered politicians during the height of Jim Crow here in Charm City and six years before the landmark Brown vs. Board of Education Supreme Court ruling. 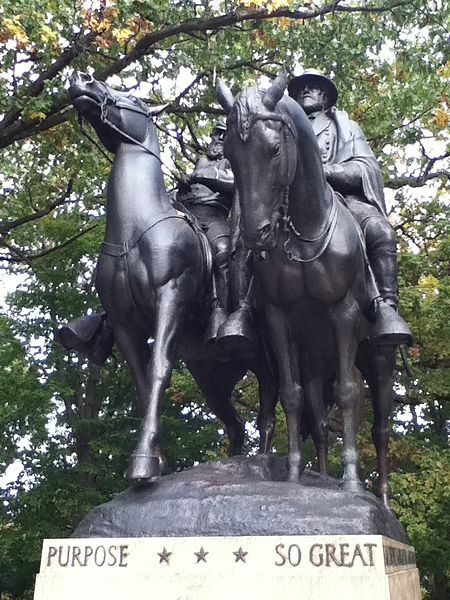 “World Wars I and II found the North and South fighting for a common cause, and the generalship and military science displayed by these two great men in the War between the States lived on and were applied in the military plans of our nation in Europe and the Pacific areas. “Today with our nation beset by subversive groups and propaganda which seeks to destroy our national unity, we can look for inspiration to the lives of Lee and Jackson to remind us to be resolute and determined in preserving our sacred institutions. What “sacred institutions” was Mayor D’Alesandro talking about “preserving” just over 69 years ago? The liberal moonbats are out in force and this time the Secret Service may not be too far behind. On Saturday at the uber-liberal Woman’s march protest in Washington, DC, the over-aged and now pretty much irrelevant pop star Madonna told the crowd that, “Yes, I have thought an awful lot about blowing up the White House.” WHAT? How is this not a terrorist threat? Sorry folks, this is not free speech. But this is what the unhinged Leftist are allowed to get away with as the liberal MSM defends such actions of violence and calls it musings. Imagine, just imagine if some one said this a day after Barack Obama was sworn into office? “Yes, I am outraged. Yes, I have thought an awful lot about blowing up the White House … but I choose love,” Madonna said from the main stage area near the National Mall. “I’m angry. Yes, I am outraged. Yes, I have thought an awful lot about blowing up the White House. But I know that this won’t change anything. We cannot fall into despair. As the poet W. H. Auden once wrote on the eve of World War Two, “We must love one another or die.” I choose love. Are you with me? Now that the heat is on the foul mouthed singer, Madonna suddenly claims that her remarks were taken “wildly out of context”. Oh, of course they were Madonna. So taken out of context as you had no problem inciting the liberal, moonbat mob on Saturday with you vile and destructive rhetoric. Just like with all free speech there are consequences to your actions. Hopefully the Secret Service will be paying you a visit. While taking part in a protest march in Washington DC on Saturday, the singer said she had thought “an awful lot about blowing up the White House”. Trump supporters reacted angrily, claiming that there would have been uproar if such a comment had been made about former president Barack Obama. Madonna has now said her remarks were taken “wildly out of context”. “Yes, I’m angry. Yes, I am outraged. Yes, I have thought an awful lot about blowing up the White House. But I know that this won’t change anything,” she said in her speech. Kellyanne Conway, a senior White House aide, described Madonna’s speech as “destructive”. She also drew attention to some reports that the secret service had been made aware of the singer’s comments. Why would anyone in Middle America want to be like those seen below? This is what the far-LEFT and the Democrats have become these days. Those of the fence politically are now running to support Trump after waiting the lunatic LEFT and their anarchist actions. Hundreds of protesters arrested today in Washington, DC as moonbats were on parade. A pair of police officers were injured and 95 protesters arrested after they smashed windows, damaged cars and threw rocks at police near Donald Trump’s inauguration ceremony on Friday in Washington, D.C.
After the swearing-in ceremony, demonstrators near 12th and K streets threw rocks and bottles at police, who were clad in riot gear and attempting to disperse the crowd. A large number of police were on scene and used smoke and flash-bang devices to try to scatter the protesters. Yesterday’s Senate Armed Services Committee hearing with former Secretaries of State Henry Kissinger, Madeleine Albright, and George Shultz. was interrupted by protesters from “Code Pink”. The protesters wanted to arrest the 91 year old, former Secretary of State for War crime. Finally, Senator John McCain (R-AZ) had enough and lashed out at the protesters disrupting the hearing and called them “low-life scum.” McCain apologized to Dr. Henry Kissinger for the protesters actions to a man who served his country with the greatest distinction. I’ve been a member of this committee for many years, and I have never seen anything as disgraceful and outrageous and despicable as the last demonstration that just took place. You know, you’re going to have to shut up, or I’m going to have you arrested. If we can’t get the Capital Hill Police in here immediately. Get out of here, you low-life scum. 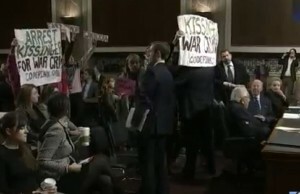 The niceties of Washington went out the window Thursday when protesters disrupted a hearing with Henry Kissinger — and Sen. John McCain went ballistic. “Get out of here you low-life scum,” proclaimed the Arizona Republican. The demonstrators were at the Senate Armed Services Committee to go after Kissinger. “Arrest Henry Kissinger for war crimes!” they screamed, some carrying signs spelling out their hatred of the former secretary of state. “You’re going to have to shut up or I’m going to have you arrested,” McCain told the demonstrators after they disrupted his press conference. UPDATE I: Code Pink Tries to Arrest 91-Year-Old Kissinger for ‘War Crimes,’ Get Smacked Down by 94-Year-Old George Shultz. Shultz then stood up to verbally battle the protesters, saying, “I salute Henry Kissinger for his many contributions to peace and security.” That led to a standing ovation from the committee members and audience that drowned out Code Pink.